D4D - "Great invention, the nuclear hand-grenade. Now all we need is someone to throw it thirty miles." Great invention, the nuclear hand-grenade. Now all we need is someone to throw it thirty miles. There are other places I still want to go (and I’m considering another Scotland visit at some point in 2017) but I won’t be going to anywhere like as many as this year. I’ve massively enjoyed it, and I truly don’t want to become blase about the entire thing. In a D4D™-traditional way, it’s time to look over the last year and make ready for the next year. Again, I did OK on this. The health and exercise has kept up, although I haven’t been visiting the gym. Weight-wise, I lost some, then put it on, then lost it again, so again I’m back to pretty much where I was. I’d like to have lost more, but I can understand why I haven’t (and there’ve been some other insights this year that I’ll take into next year) Next year has its own challenges, with that walking Marathon next September. I’ve been doing more writing, but they’re more works-in-progress than completed items. I’m still aiming to get more done, and that’s part of the plan for next year. Having taken one proper ‘retreat’ weekend last month, I think I’ll do more of them next year and hopefully come out with some finished pieces by the end of it. Not quite so successful. I’ve laid a lot of the ground work for the coming year, and some of the stuff I’ve written for other projects will translate into the next phase, but no, most of the focus has been on paying clients. Particularly the main one, where the work has continued for much, much longer than I’d expected. All told, it’s been a good year. I’m pleased with most of it, although there are some bits I would’ve liked to do better, or differently in hindsight. But yeah, a good year. This last week has been (yet again) pretty hectic and chaotic. Today is slightly quieter, Friday I’m in Chesham, and then for the weekend I’m up in Manchester. I must be bloody barmy. A while back, I laid out one of my main targets for next year, to do the Shine Nightwalk Marathon. 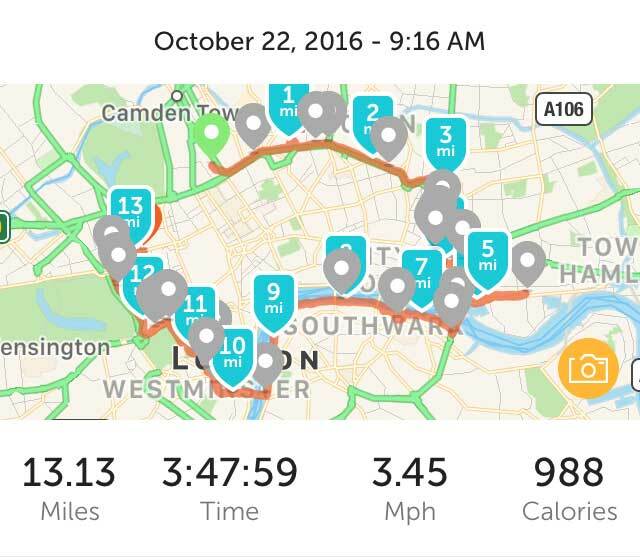 And because of that, I also set myself the “lesser” challenge of walking a half-marathon, as a proof that I was at least capable of it. I wanted to prove – as much to myself as to anyone else – that I could walk that 13.1 miles in a reasonable time, not fall apart by doing so (or afterwards) and really just that it was doable. I also wanted to be get a rough outline of how long it would take, to give myself a feasible target time come September. Yesterday, with sod-all planning or training, I went down to London (might as well do the trial in the same kind of place as the actual event, after all) and did it. It wasn’t as fast as I’d hoped for, but at the same time it was about what I expected. There’s still stuff to be done, and I’ll be working on all of it – more walks etc., better distances and better times – but for a first attempt, I’m pleased with how it went. I’m less sure now that I’ll be able to do it in my intended six hour target, but an eight-hour will be certainly be doable, with seven being (I think) realistic, and I’ll be happy with that, although I’ll continue to aim towards the lower times and see how I do. I slowed down significantly after about 8 or 9 miles, which was partly being tired, but also partly being held up by lots of slow-moving people. I hurt a lot less than expected afterwards, too. Sore feet and some muscle aching in my legs, but that’s about it. I’m pleased that I’ve done it, and that I’ve proved to myself I can do the full thing. I know the full thing is still double that distance, and that it’s still a big thing to complete, but I do feel more confident now that it’s something I can do. Collecting the new (to me) Kia Ceed yesterday, it made me think again about how much things have changed over the last few years. Back when I had to get the Saab, I was mid-bankruptcy, and the available funds were super-tight. I got lucky with the Saab – very lucky, in fact – and in some ways I needed to get that lucky. This time round, while things haven’t been perfect, I’ve been able to do much better. I’ve moved a fixed amount from savings to bank account, and worked within that larger-but-not-huge budget to get the Kia. I could’ve taken out more, but didn’t want to drain the savings entirely. I could’ve spent more from the budget, not bothered with the maintenance/parts warranty. I didn’t want to, but I could’ve done. I had options. I hope that the Kia will last me a couple of years. I’ll spend that time rebuilding savings and so on, and hopefully be in a better place again when it comes times to replace it. By then I should be OK to look at sorting out a finance agreement, rather than paying outright, which will be another step in the rebuilding process. A lot has changed in the three-and-a-half years I’ve had the Saab. A lot more will change during the expected lifetime of the new one. And that’s nothing but good. About six weeks ago, I wrote about the changes to my intended savings plans for this year, and how it was affecting things. Basically, I’d had a plan of how much I wanted to put into my savings account this year, and that hasn’t happened. There’s been a lot of other stuff going on instead, but all the same, it’s been a bit annoying to have not managed that target. Since then, though, I’ve been adding in to the savings account, and making progress. I won’t get to the original target figure for this year – but putting some in is better than putting none in. So since that first post, I’ve put in the full amounts of a couple of invoices for work I’d done, but also a bit more than 10% of each piece of income has gone straight back out to the savings, so I don’t even really notice it’s gone. In honesty, that’s what I should’ve been doing all of this year, but I was looking at it from a flawed perspective. (I can’t be bothered to explain that right now, but may do some other time) I’m intending to keep doing the same for the rest of this year, and do the same but with more money next year, and see how we go. Monday – visiting Newquay. Another place I really liked. Tuesday – down to The Chocolate Factory, a craft-based place with a whole range of different things, including (unsurprisingly) a chocolatier, but also galleries, glass maker, jewellers etc. Then on to St Ives for an explore (including seeing a seal in the harbour) and then back to Helston to meet up with other friends. Friday – Wheal Martyn China Clay museum, which was interesting. I didn’t know the history of china clay in Cornwall, so it made for an interesting morning. Followed up by a visit to St Austell (frankly, never again – it’s like the retirement village of The Damned) and then a much better visit to Charlestown, which is really pleasant and attractive – another place I could happily stay longer. Saturday (today) – Driving home, again via Oxford. Another good run, four hours door-to-door to Oxford, and then onwards to home. As well as driving that 1,000 miles, we’ve walked about 40 miles all told, visited a bundle of places, and had a good time. I’ve got a bundle of stuff lined up now for the next three months, as well as a load of stuff to think about for the future. Next year’s looking interesting already.